MyHIJAU is an initiative by Malaysian Green Technology Corporation (GreenTech Malaysia) to promote the sourcing and purchasing of green products and services in Malaysia. Its aim is to encourage the adoption of environmentally friendly practices in the country, while catalysing the growth of Malaysian’s green economy. In tandem with the Malaysian Government’s green procurement policy and the proposed introduction of green technology tax incentives in 2015, MyHIJAU provides the essential guide for government and corporate green purchasing by registering certified products and approved service providers, through the MyHIJAU Mark and MyHIJAU Directory. 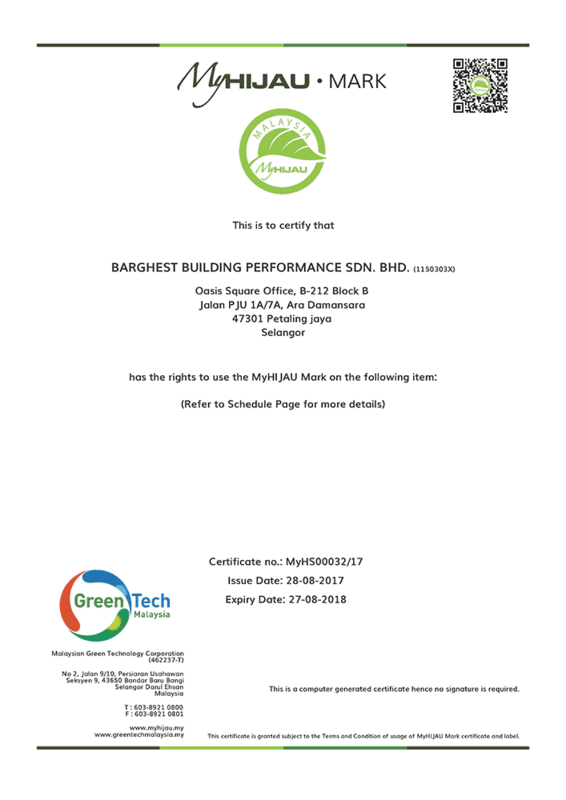 Becoming MyHIJAU certified provider allows our clients to access financing support from Malaysian Government when using products and services from Barghest Building Performance.